In March and April of 2015, BRAVO! 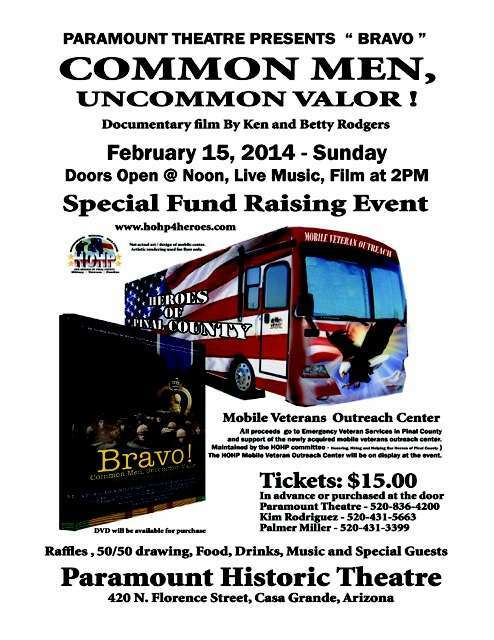 COMMON MEN, UNCOMMON VALOR will be screened in a number of Idaho locations as a fundraiser for the Idaho Veterans’ Network and for Veterans’ Treatment Courts. These screenings are scheduled for Boise, Caldwell, Lewiston, Pocatello and Twin Falls. Before giving some details about the events, we first want to delve into the existence of Veterans’ Treatment Courts. What exactly is happening in this country that would support forming courts specifically for and exclusive to veterans? First, the thing that should not have to be said, we will state: If we require our warriors to go off and participate in combat, then we have a responsibility to see that they also have every opportunity to integrate back into our society and lead successful, productive lives. Combat causes veterans to experience trauma that often makes that integration difficult. Veterans’ courts are one way in which we acknowledge the fact that combat related trauma is a cost that needs to be dealt with by our society. -Roughly one in five combat veterans from the Middle East conflicts has symptoms of mental disorder or cognitive impairment including Post Traumatic Stress Disorder (PTSD) and/or Traumatic Brain Injury. -Roughly one in six veterans of the current conflicts has substance abuse issues. -PTSD and Traumatic Brain Injury can lead to mental disorder or cognitive impairment and substance abuse, which can lead to issues with the judicial system. -There are approximately 2.5 million veterans of the current conflicts. -A one in five ratio indicates there are somewhere in the neighborhood of 500,000 veterans of Middle East wars with mental disorders or cognitive impairment. -A one in six ratio amounts to approximately 400,000 veterans with substance abuse problems. Veterans’ courts allow for the veteran to appear before judges and court officials who are familiar with the problems brought on by combat-related PTSD and Traumatic Brain Disorder. The staffs at veterans’ courts link the men and women appearing in their venues with various veteran service groups such as the VA and state organizations that can help them get back on track. They also require the veterans to go to counseling and to undergo drug screening if necessary. We are pleased to announce that proceeds from the upcoming Boise screening of BRAVO! 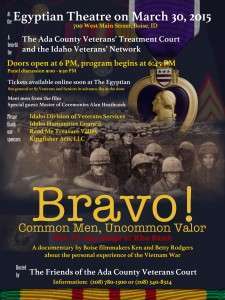 at the Egyptian Theatre on March 30, 2015, will go to help fund the Ada County Veterans’ Treatment Court non-profit as well as the Idaho Veterans’ Network, both of which help veterans who are taken into the Veterans’ Treatment Court system. Your attendance at this event will provide funding to help defray the costs of transportation, mandatory drug testing, rewards for participation, and other necessities. To further illuminate the good work being done here in Idaho, we offer the Idaho Veterans Network mission statement: The mission of the Idaho Veterans Network is to help distressed veterans and their families by facilitating peer-to-peer support and guiding them to resources available to them in order to create a veteran population that is capable, confident, and committed to their community. So please join us for the Boise screening at the Egyptian Theatre on March 30, 2015. Doors open at 6:00 PM with program beginning at 6:45, film at 7:00, followed by a Q & A session from 9:00 to 9:30. Several of the men who are in the film will travel here to be on hand for the discussion, along with other local veterans and the producers, Ken and Betty Rodgers. Master of Ceremonies Alan Heathcock, Boise’s world-renowned author of VOLT, will make the introductions and facilitate the panel discussion. Tickets may be purchased online as soon as they are available on the Egyptian Theatre’s website. Come on out, bring a friend or relative, and support the efforts of our Ada County Veterans’ Courts and our Idaho Veterans Network. As soon as details are available about the other upcoming Idaho screenings of BRAVO!, we will pass them along to you. Also on the screening front, mark your calendars for a fundraising screening in Casa Grande, Arizona, on February 15, 2015, at the historic Paramount Theatre. Doors open at Noon, lunch served at 1:00 PM, screening of BRAVO! to follow at 2:00 PM. Ticket cost: $15.00 advance purchase or at the door. Proceeds will benefit the Mobile Veterans Center and Emergency Veterans Services in Pinal County. If you or your organization would like to host a screening of BRAVO! in your town next spring or summer, please contact us immediately. BRAVO! has a page on Facebook. Please “like” us and “share” the page at https://www.facebook.com/Bravotheproject/. It’s another way to stay up on our news and help raise more public awareness of this film.